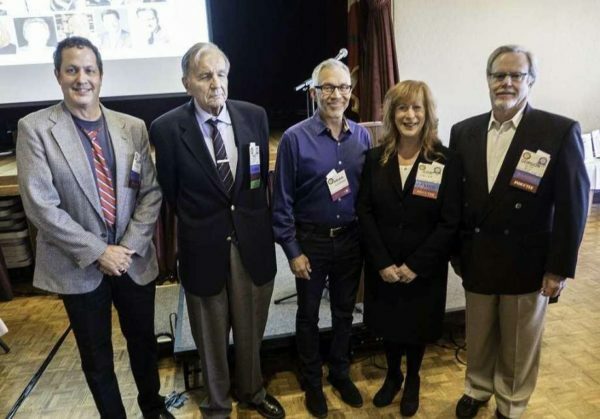 Honorees at the 2018 Bay Area Radio Hall of Fame ceremonies included (from left) Jon Bristow, Fred Krock, Brian Sussman, Jude Heller and Gordon Zlot. If I believed that nonsense, I wouldn’t be able to report on the 13th Bay Area Radio Hall of Fame induction luncheon. Actually, the food was good at the Basque Cultural Center in South San Francisco; so was the weather. And there were plenty of opportunities for schmoozing. The event, hosted Oct. 13 by the Broadcast Legends, welcomed 10 broadcasters into the Hall of Fame, along with a Legendary Station of the Year (KDIA). And it did not enshrine, but honored KSFO’s Brian Sussmanfor winning the popular vote, if not the electoral college, for a Don Sherwood Award. Now, I am close to the Legends, the hall of fame (for whatever reason, I was inducted in 2010) and its affiliate, the California Historical Radio Society. So I’ll be as gentle as possible. It began with a microphone malfunction and the wrong inductee being called up, throwing two parties into confusion: the inductee expecting to go up first, and the presenter who thought she was far later in the program. It ended, nearly two hours later, with KDIA, the powerful R&B station of the ’60s, being represented by … no one. I heard that BARHOF tried hard to get one former staffer to show up, without success. So the station got a reading of a truncated history. It deserved much better. So did the late Gene Burns and Scott Beach, who had no one accepting for them. Besides those glitches, there were typos on the video screen, so that Bill Wattenburg and Patricia Krock (wife of inductee Fred Krock), being noted in an “In Memoriam” segment, had their names botched. But the worst mistakes were the most obvious. Several videos failed to play. Greg Papa, inducted in the sportscaster category, was out of town and sent a video. He chose, as his presenter, former radio executive Tony Salvadore, who also made a video. Neither one played properly, and MC Terry McGovern had to improvise, lip-syncing over the silent Salvadore: “I’m happy to miss this lunch. Last year the pasta gave me heartburn.” McGovern was hilarious, but the snafu was a disgrace. And for the induction of KYA star Chris Edwards, his widow, Cynthia Edwards Reinholtz, a devoted volunteer to CHRS since his death in 2014, had a special audio-video montage to accompany her speech. It never materialized. She soldiered through her tribute and won praise from her table, which included three KYA alumni, Steve Rood, Tom Saunders and, flying in from Washington, D.C., “Tall” Tom Campbell. Despite the support, she was crushed.